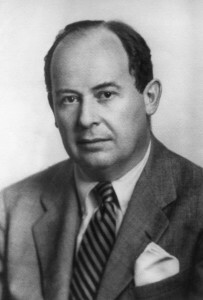 Died: Feb 8, 1957 (at age 53), in Washington, D.C.
John von Neumann was famous for his brilliant mind. His origin is Hungarian and he is still celebrated for his enormous yet unparalleled contribution to the field of physics, mathematics, economics, and computing. He was born in a wealthy Jewish family, during his entire upbringing he exhibited great computing and analytical skills. On December 28, 1903, in Budapest, Hungary, Neumann was born. During his early life, learning was encouraged and he showed enthusiasm in learning new things. He was not only astonished by numbers, but he also found history a very exciting subject. In fact, he read four volumes of universal history at age eight. His personality defined him as a person who both liked logic as well as social life. At age six, he was doing mental calculations in his mind like memorizing phone directory numbers and also exchanging classical Greek jokes. His first paper was published in 1922 and illustrated the algorithm of an array of eight zeros. Although his father pushed him to pursue a marketable course in engineering, Neumann still had the genetic make-up for mathematics. He did his undergraduate at Pázmány Peter University, Budapest, and he received a diploma in chemical engineering from ETH Zurich, Switzerland. Later, he emerged as the only person who ever completed both an undergraduate and Ph.D. at age 17. The field of cellular automata was first recognized with John von Neumann analysis where he demonstrated self-replication of automata without the aid of a computer, but rather with a simple pen and graph paper. He was greatly admired by business men and governments for his awe-inspiring abilities. One time he manipulated the polar ice caps by spreading colorants thereby raising global temperatures. He is also notably recognized as the mind behind atomic bombs. He contributed to the government-funded American project in development of nuclear bombs and also developed the idea of designing explosive lenses in preparation for the World War II. This same mathematical application helped him develop the architecture of the MANIAC (mathematical analyzer, numerical integrator and computer) that was unleashed way before silicon was invented. It was the most powerful and fastest computer ever developed at the time. The hydrogen bomb is also recognized with Neumann’s work. In conjunction with Stanislaw Ulam, they developed simulation over the now stable computer on hydrodynamic computations. At the same period, he also contributed to the advancement of Monte Carlo method for operations research that allowed complex problems to be solved using random numbers. In the field of economics he is better recognized in developing the minimax theorem (1928). John von Neumann was an inspiration to many modern physicists and mathematicians. For instance, his unaccomplished work on game theory was finished by John Forbes Nash. In his lifetime, he has received numerous accolades and honors with respect to the wide-ranging contribution he has made in all academia. Neumann passed away on February 8, 1957, as a result of cancer.